Gratis NOLA! 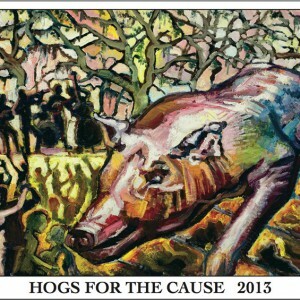 : Weekend Fun with Hogs for the Cause, St. Baldrick's, and Festivals Galore! Weekend Fun with Hogs for the Cause, St. Baldrick's, and Festivals Galore! Happy weekend and we deserve it!! The delicious smell of pork and the amazing sounds of music are filling the air over at City Pork (a/k/a City Park) tomorrow for Hogs for the Cause! This pork lovers paradise includes 80 competing BBQ teams plus lots of beer, food and trucks and of course music! The musical line-up is spectacular with the Lost Bayou Ramblers, Rebirth Brass Band, Robert Randolph and the Family Band with special guest Anders Osborne and more!! And remember all the money goes to a worthy cause - to aid families with children suffering from pediatric brain cancer. So get high on the Hog for a very good cause! Tickets are $15 in advance and $20 at the gate - Gates open at 11:00 am - for more info click here. Celebrate St. Baldrick's Day and help out kids with pediatric cancer. There are two big events going on Saturday where you can have some fun and help out!! Come on over to Finn McCool's Irish Pub (3701 Banks Street) at noon for some head shaving, some Irish fun and libations! And if you happen to be in the Quarters head on over to the French Market for the Nola Food Fest! The flavorful fest runs Saturday 11:00 am to 7:00 pm and Sunday 11:00 pm to 6:00 pm. Four blocks in the French Market will be lined with dozens of top Food Fest cooks from New Orleans and all of Louisiana as well as from all across America, each offering a unique specialty. This is NOT typical and expected festival fare: it is a taste of America's most celebrated dishes, all gathered in one place: a foodie's dream. Portions are right-sized and priced to provide everyone a chance to taste the maximum number of great regional eats as they stroll through the French Market inhaling delicious smells that range from real Texas pit barbecue to Pecan Pie to artisan boudin sausage made by Cajun country's most beloved butchers. There is no admission fee - just bring plenty of appetite! For more info visit here. And while your in the Quarter head on over to Armstrong Park for the Congo Square New World Rhythms Festival - Saturday and Sunday, 10:30 am to 7:00 pm. Popular Brooklyn-based bhangra funk band Red Baraat and the great Cuban percussionist/singer Pedrito Martinez will be among the featured performers at the sixth annual Congo Square New World Rhythms Festival, in Armstrong Park. The Congo Square New World Rhythms Festival is one of the cultural enrichment events produced and presented by the New Orleans Jazz & Heritage Foundation. This event showcases the music and culture of the African Diaspora, tracing the musical voyage from Africa to the Caribbean and the Gulf South. Free admission and for more info click here.